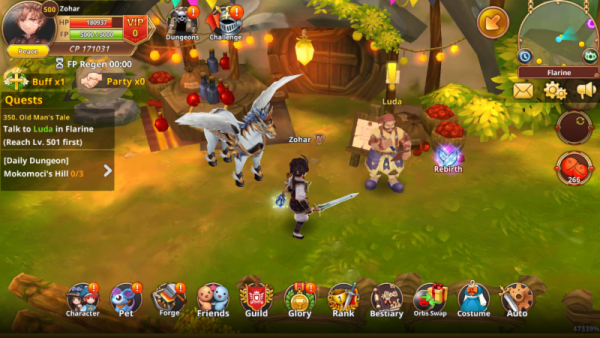 Seoul–September 26, 2017–Gala Lab Corp. today announced the launch of Flyff Legacy, a free-to-play mobile MMORPG based on the popular PC game Flyff Online. Launched in 2004, “Fly for Fun” (Flyff) was the world’s first flying RPG and quickly became a standout hit among free-to-play online RPGs. Flyff Legacy combines the charming anime style and social aspects of the original game with new graphics and gameplay especially designed for the mobile experience that will appeal to longtime fans and new players alike. Flyff Legacy takes place in the fantasy world of Madrigal where players may create a Mercenary, Acrobat or Magician character and embark on an epic quest to learn to fly on a broom, party up with other adventurers, and make their way through countless dungeons. As your character gains experience, they can acquire better gear and special costumes, collect pets and level up their brooms. While quests and dungeons offer exciting opportunities, the real excitement and glory comes from challenging other players in PvP instances, and only the most daring venture into Open PK lands. Flyff Legacy is now available in the US and Canada for free download from the App Store and Google Play. GALA (TYO:4777) group is develops and publishes free-to-play MMOs and smartphone games. The GALA Group was among the very first companies to publish free-to-play PC MMOs in the United States and Europe starting in 2005 via its gPotato game portal (acquired by Webzen Inc. in 2013). GALA Lab is a subsidiary of GALA located in Seoul, Korea that develops PC and mobile MMORPG games around its 2 leading franchises “Flyff” and “Rappelz”.